Those were the days. We couldn't afford much film or much lens. But we had a great appreciation for nature, and many adventures. Somehow, out of that combination, came a few worthy photos, now digitized for this collection. We think of them as our classics, which sometimes has more to do with memories than with fine art. For example, the leopard in the tree is not fully focused. (The circumstances made taking the shot tricky.) But it was "our" leopard, discovered by providence and persistence. We share it here for its story. But even if you don't know all the stories behind these photos, we hope that among them you may find a classic or two for yourself. 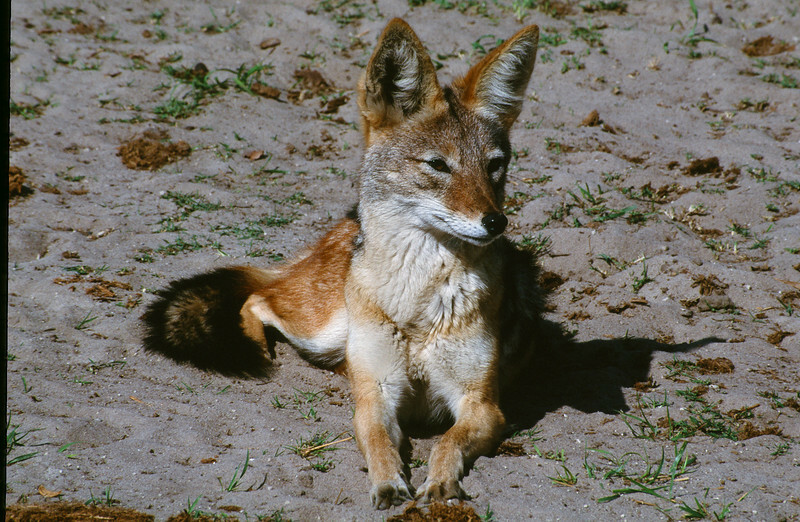 Sitting Jackal: A Black Backed Jackal at rest. Location - Hwange National Park, Zimbabwe, Africa.